10th Ever L.A. Old Time Social Friday Night Concert! The Gallus Brothers sound like a record collection found in the basement of a retired acrobat with a penchant for good old fashioned blues. Devin Champlin savagely syncopates on a reso-phonic guitar, while Lucas Hicks amps it up by playing percussion on a suitcase full of bones, bells and antique tomfoolery. 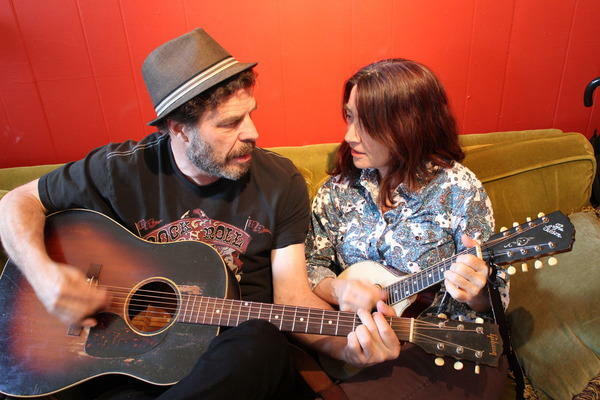 Both are talented multi-instrumentalists and their sets are a mix of country blues, old tin pan alley songs, mandolin and fiddle tunes, and a dash of danger by way of acrobatic antics. They have played across the US and Canada from festival stage to smoky bar, wooing crowds with their fun music, their good humor, and their willingness to jump on a table, stand on each other, and juggle while playing a good old tune from way back when. John Grimm and Beverly Smith live in the mountains of North Georgia in the beautiful little town of Dahlonega, in Lumpkin County. For the past 25 years, John has owned and operated the towns music store, Vintage Music, while Beverly toured the world in various band configurations. Since 2010 John and Beverly have been performing together at festivals, concerts, workshops and dances across the country and abroad. 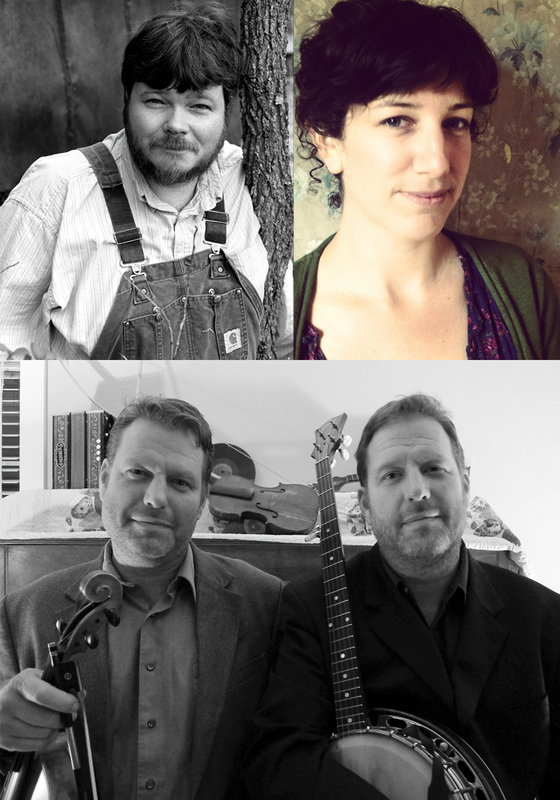 Their performances feature traditional country duets, fiddle tunes and originals. They choose their songs well; their traditional songs and tunes reveal a deep familiarity with and great love for the genre. From archaic banjo and haunting fiddle tunes to raucous hillbilly singing and aching ballads they display an ease that sounds nothing but genuine. John Grimm is an award winning fiddler and multi-instrumentalist who has played with many old time bands such as The Georgia Mudcats, The Georgia Potlickers, and Rural Radio Company. He was a recent recipient of the Dr. Gene Wiggins Award in recognition of long and significant contributions to traditional music in N. Georgia. Dr. Wiggins was the author of the book “Fiddling Georgia Crazy” the definitive book on fiddler John Carson. John played the role of John Carson in the PBS film “The People vs. Leo Frank” and has appeared in the Atlanta production of “The Cotton Patch Gospel”. In addition to his old time performances he teaches fiddle with the highly successful “Pick & Bow” after school program, and has played with The Indigo Girls, Jonathan Byrd, Shawn Mullins, Rising Appalachia, The Little Country Giants, Pauline Scanlon and others. One of the most respected guitar players in old time music today, Beverly Smith is also in demand as a singer, fiddler, and dance caller. Besides her three highly praised recordings of early country duets with mandolinist Carl Jones, her guitar playing has been featured on recordings of fiddlers Bruce Molsky, Rafe Stefanini, Tara Nevins and Brad Leftwich, and her singing with Mick Moloney, John Doyle, Laurie Lewis and others. Along with June Drucker, Rose Sinclair and Tara Nevins, she was a founding member of The Heartbeats Rhythm Quartet. She has taught guitar, fiddle and dance at music camps including Ashokan Southern Week, Augusta Heritage, Swannanoa Gathering, Blue Ridge Old-Time Music Week, Festival of American Fiddle Tunes and Summer Acoustic Music Week as well as Sore Fingers UK; Haapavesi, Finland; and La Fuente del Musica in Spain. She has been a featured guest on A Prairie Home Companion, ETown, Mountain Stage and Voice of America, has toured extensively in both the US and the UK, and has played concert halls and festivals all over Europe, Canada and the US. Her guitar playing was featured in the October 2000 issue of Acoustic Guitar Magazine. Besides her duo with John Grimm, Beverly currently plays and tours with Alice Gerrard, the indisputable Queen of Old Time Music. 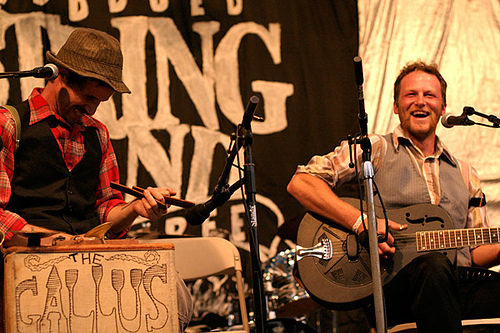 Riley Baugus represents the best of old time American banjo and song. His powerful singing voice and his expert musicianship place him squarely in the next generation of the quality American roots tradition. Riley first came to music through his family. His father had a love of old time music which touched the young Riley on a molecular level. His family’s attendance at Regular Baptist church gave him early exposure to the unaccompanied singing that is a time-honored tradition for ballad singers throughout the Appalachians. Starting on the fiddle, Riley quickly moved on to the banjo, building his first instrument from scrap wood with his father. With a friend, Riley visited elder traditional musicians throughout North Carolina and Virginia. When not teaching or building banjos, Riley can be found out on the road performing. He plays with the Dirk Powell Band and with Kirk Sutphin. He is a frequent guest of Polecat Creek and of Tim O’Brien with Dirk Powell. With Ira Bernstein, he presents the show “Appalachian Roots”, a unique showcase of Appalachian music and dance. Riley makes his home near Winston-Salem, North Carolina. Sabra Guzmán has been a part of Virginia since 2007, where she’s become a fully entrenched member of the burgeoning old-time & country music scene of the Appalachians and beyond. A founding member of the award winning old-time bands Old Sledge and Old Buck, Sabra is well known for her solid guitar & bass skills, her unique vocal stylings, and her captivating stage presence. She has been seen at many prestigious venues & festivals – Freight & Salvage, Pickathon, Blackpot, Club Passim, The Los Angeles Old Time Social, The Ark, Floydfest, Bristol Rhythm and Roots – and received a coveted first place Traditional Old Time band at the Clifftop Appalachian Stringband Festival. Sabra brings a musicianship and her unique approach to all projects, regardless of genre or instrumentation. The Stuart Brothers are world renown for their masterful performances of Appalachian fiddle and banjo duets. Trevor and Travis were born and raised in Bethel , a rural farming community in Haywood County, NC — an area of magical beauty where the Blue Ridge and Great Smoky Mountains meet and once the ancient Cherokee settlement of Sonoma. These majestic ranges surrounded the young brothers with the rich musical and cultural environment of Appalachian fiddle tunes, Baptist spirituals, banjo pickers, all night square dance shindigs and poetic tale weavers. With deep family musical roots, their great grandfather was the legendary fiddler Rev. Henry King, and great uncle the banjoist and singer Austin Stamey. The brothers learned some of the oldest regional fiddle and banjo styles from masters such as the Smathers Family, Byard Ray, Oscar “Red” Wilson, Gordon Freeman, and the Sutton family. They formed their first band in junior high and played for local clogging teams, local functions and fiddlers conventions. Since then they have toured extensively throughout the US and several foreign countries, teaching and performing at major festivals and music camps. The Happy Neighbor Club loves getting together to explore old-time string band traditions from obscure corners of the globe. 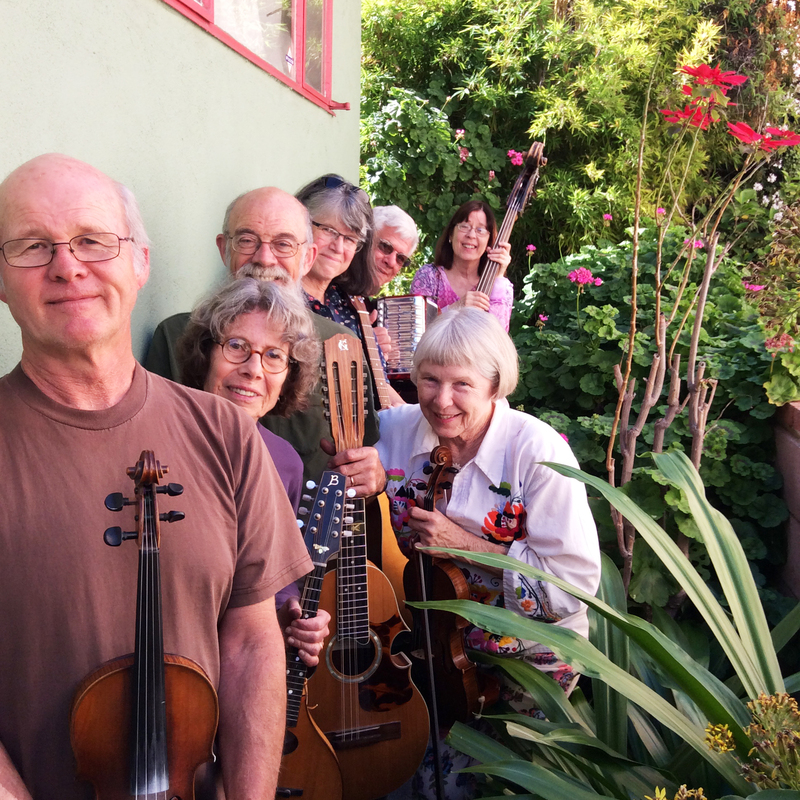 The members, all from the greater Los Angeles area, have been playing music since the 1960s in various configurations, but met a dozen years ago upon discovering a shared love of early 20th century dance tunes played on fiddle, mandolin, accordion, guitar, cello, and bass. Expect to hear an exotic mix of Mexican paso dobles, Hawaiian marches, Italian polkas, Texas rags, Puerto Rican mazurkas, and even a Finnish hummpa. This entry was posted on Saturday, March 7th, 2015 at 11:12 amand is filed under . You can follow any responses to this entry through the RSS 2.0 feed. Both comments and pings are currently closed.